Have you ever been so close to your dream coming true that you could taste it? Well, that was me yesterday. This website has grown enough that I am ready to take one foot off the corporate treadmill and transition to a part time position! There is nothing I want to do more than to stop punching a clock and live life on my own terms. Words can’t adequately describe how excited I am to see that day coming! However, that day was not yesterday. I applied for a part time position at work, and I was thrilled to get the job offer, but we ended a mere $.50 an hour apart on pay. Crap. I was still very tempted to take the position, but since I was already agreeing to take a sizable pay cut, in the end I couldn’t justify selling myself short of what I know I am worth in the same position elsewhere. It would be hard to stay satisfied when you are being knowingly underpaid, right? 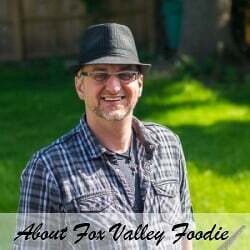 So, I’ll be keeping my focus on growing FoxValleyFoodie.com, where my income is only limited by my creativity. 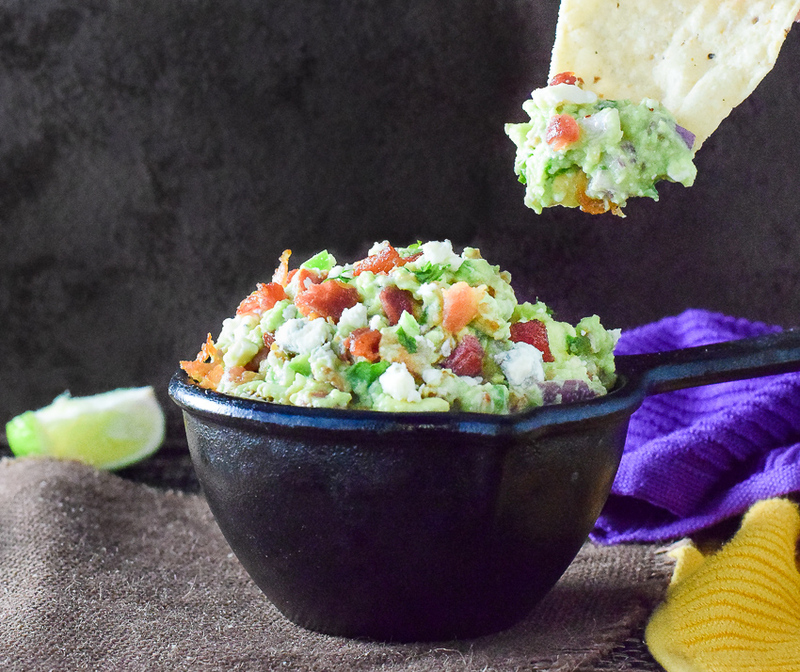 That, of course, means writing up tantalizing recipes for you all, like this Blue Cheese and Bacon Guacamole Dip! It is a salty and crunchy twist on the classic guacamole recipe! 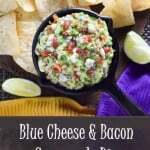 Blue Cheese and Bacon Guacamole Dip is a quick and easy appetizer to prepare when you are craving something out of the ordinary. 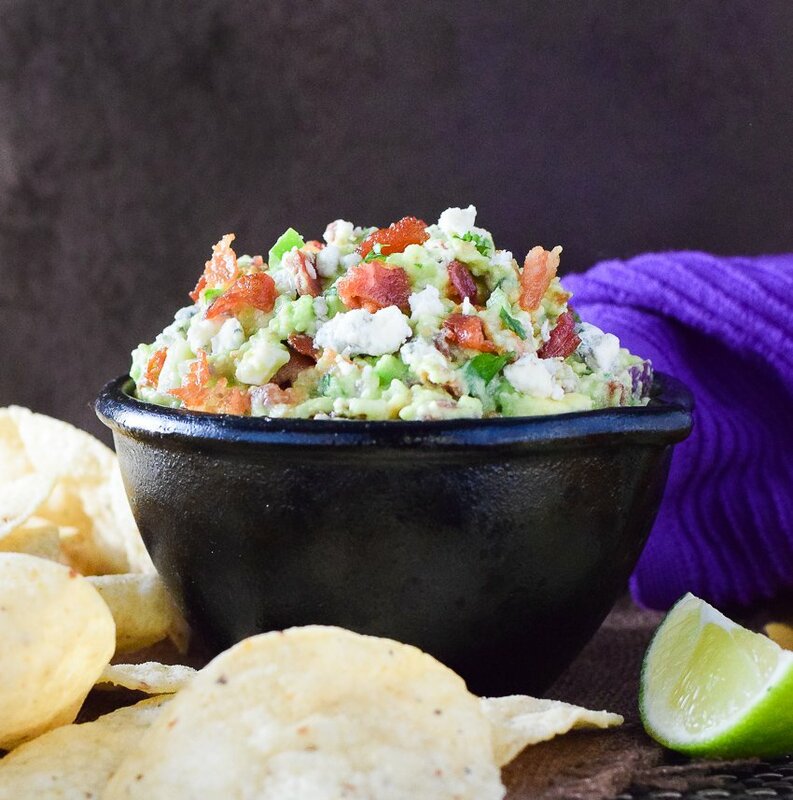 It boasts all of the classic guacamole flavors, plus the briny taste of blue cheese, while the smoky crunch of crisp bacon is infused throughout! To make this recipe you will want to have a lime juicer on hand. It is certainly possible to just squeeze the juice out of the limes by hand, but I find a good lime press will give you a better yield and leave you with cleaner hands. The above link is an affiliate link. Any Amazon purchases made through these links help support FoxValleyFoodie.com at no additional cost to you. 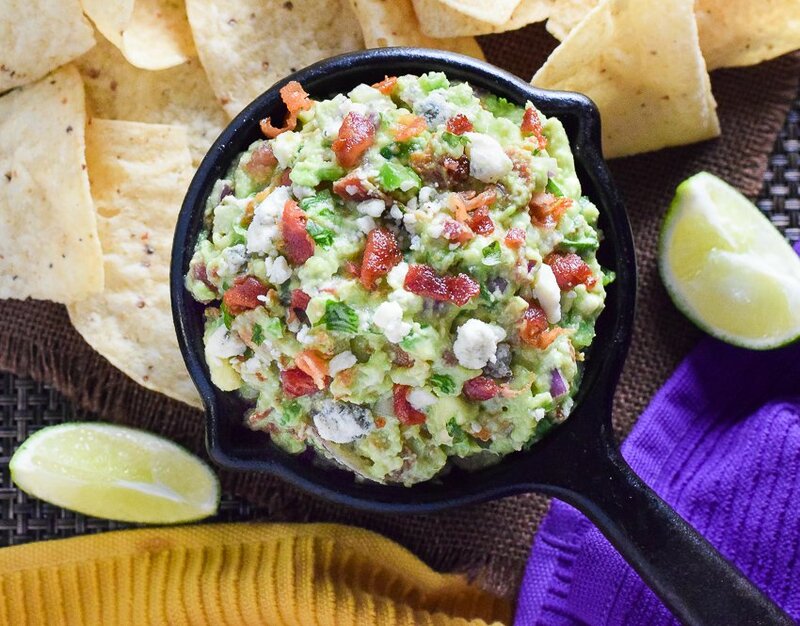 Blue Cheese and Bacon Guacamole Dip boasts all of the classic guacamole flavors, plus the briny taste of blue cheese, while the smoky crunch of crisp bacon is infused throughout! Cut avocados in half and scoop out the flesh into a bowl, removing the pit. Add chopped onion, jalapeno, lime juice, cilantro, and blue cheese. Mash the mixture until it is chunky and creamy. Add crumbled bacon once cooled and mix to combine, salt to taste. Lime juice will help prevent the avocado from turning an unappetizing grey color so make sure you mix it in shortly after scooping out the avocado. If you enjoyed my Blue Cheese and Bacon Guacamole Dip recipe then you should probably like me on Facebook and follow me on Pinterest too. That’s what I would do at least, because if you don’t get to know me but you still use my recipe it is kind of like taking candy from a stranger, and your mom taught you not to do that. Don’t disobey your mom, subscribe to Fox Valley Foodie today. I wish you the best. I recently left a job I was extremely unhappy at, and currently my blog is my only source of income. I’m curious to see whether or not I can grow it, now that I have some time to actually devote to all the things I’ve let slide in the past. That dip looks perfect for a New Year’s get-together. Pinned! Thanks! It is exciting and scary at the same time, isn’t it? OMG. That seriously looks delicious. I cannot wait to try it!!! I love this beefed up guac! Blue cheese and bacon are a great way to add some more flavor to guac! When I am off my whole30 I am trying this!!!! YUM! You will love it! I made a double batch and it still didn’t last the night!